Samsung's Super AMOLED S8500 Wave phone is now available for UK's T-Mobile network. You can get it unlocked for £366.99. With a plan the handset ranges from £59.99 to free, depending on the monthly payments. The Wave has a 3.3" 800x480 Super AMOLED display and runs Samsung's Bada OS. That's a world first on both. 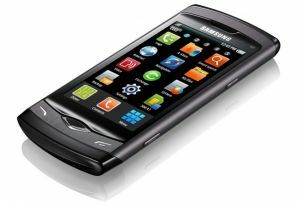 It also sports Bluetooth 3.0, Wi-Fi, 1Ghz processor, 5Mp camera, a-GPS, 720p recording/encoding and DivX/XviD support. Samsung's first Bada phone to have a "super AMOLED"